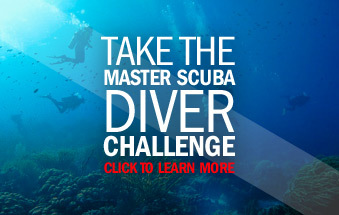 Do you think you have what it takes to be known as a Master Scuba Diver? If so, we at Northwest Scuba can help you acheive your goal. This is the highest non-professional rating in the PADI Recreational Scuba Diver education system. During this challenge, you will, learn the basics of scuba diving, explore specialties that interest you as a diver, learn how to deal with Rescue Situations, and best of all, DIVE!!! Just give us a call at 1 780-438-1218 or come into the shop and we can guide you along your path to becoming a Master Scuba Diver. Everything included in the rescue course is included in the cost of this course. Select 5 of our specialty course as part of this course. All classroom and pool sessions required for your rescue course and selected specialties. *Some specialties do require open water dives or some travel to complete. Travel is not included in the price. First aid & CPR training is not included. We also recommended AED & emergency O2 Provider which are also taught at the store. Crew packs for your specific dives will be provided..
All the equipment you need is included in the price*. Our certified instructors will teach you what you need to know. Certain dives will require getting familiar with specialized equipment and will require pool time. *Does not include 2 dive lights, tank marker light and dive knife. All the books and materials you need for this course. A great reference that covers all the material covered in the course. It’s a great refresher every time you go diving. All the equipment you need is included in the price. Get wet and have some fun in the pool while getting great instruction and learning your skills. A full day of diving working on skills and rescue scenarios. View our specialty courses here.